Isaiah Berlin related that there are only two types of people, foxes or hedgehogs. I’m a hedgehog. A generalist. A slow plodder that sees the bigger, wider picture. When it comes to language learning, this has been very handy. It’s valuable to cut through the minutiae and see the horizon, the real terrain on which language learners travel and journey. I got my beginnings in ELT as a special educator. I became fascinated at how technologies developed to help special needs students communicate and learn could be applied to help general language learners. Along the way – I always had the thought that maybe there existed a holy grail out there. The possibility that we could develop a universal library of pictographs representing language and which could aid students in learning any language. Writing (and reading) originally developed pictographically and by extension then ideographically. First with the Sumerians and their cuneiform script some 7,000 years previously. The Chinese developed their own symbolic writing system. Characters were created and modified to extend meaning. 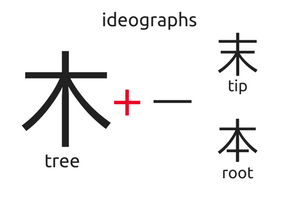 Many other languages are “ideographic”- a symbol that represents an idea or a thing, rather than the sounds of a word. Some languages are ideographic in the sense they do represent the sound too – like Korean Hangul. Our modern day emojis are ideographic too. In special education we have Blissymbols. Also other kinds of “picture sets” which students use to communicate and learn. Very basic but they allow students to communicate and function in society. Here are some basic Bliss symbols. You can see how the symbol represents the meaning figuratively. Now why am I relating all this? What does this have to do with the language learner in your classroom? Your teaching? It is important because technology now allows us to so easily catalog human experience. This in turn means, we might now be able to build the holy grail of language – a library of universal images that can be referenced to define any term, idea, meaning. This is where gifs come into play. I’ve previously written about how powerful gifs are as “language learning objects”. However, the larger value of a gif is as a universal reference to an idea. For example, this gif. For any language it can be used to help students understand the human emotion – happiness. Or joy, excitement, elation ….. It would make language learning so easy if we could reference and use a whole universal library of human experience in gif to help students learn a language. Of course, culture does often get in the way …. it’s a blunt instrument. Happiness does not mean the same thing or is expressed the same way for all peoples. However, students will and do get the meaning however un-nuanced. Also, the world is becoming a village. Gifs represent modern, changing, universal culture and the modern world. I’ve been working hard to create this gif library and make it available to all teachers to use as a teaching aid. Or just like one would a list of concordances or a corpus. See the web app – search for a term. For example: “driver”. You’ll get many examples which you can use to highlight the term and help teach it to students. Many collocations highlighted. Much, much better than any dry concordance generator or corpus tool for teaching, actual learning. It can be translated so it works the same to teach any language. We are in the process of doing so – first starting with Spanish. Students learn vocabulary with context and meaning. Visuality aids learning and acquiring the language. Gifs are very malleable materials for curriculum developers. Perfect for creating materials. Copyright is open source. Gifs are an “altered, small snapshot” of a larger experience. Plus used in a differing context than the original. Learning pathway. The gif library can be used to develop all kinds of learning pathways. In particular, they are perfect for flashcard learning and exposure. I’m continuing my quest for this holy grail of “gifdom”. You can support me by joining Gif Lingua as a teacher – you get 1 month full access (you get worksheets for every book and can download all books). Reading books is always free and without a need to register. I welcome hearing from collaborators. Imagine a tool like Duolingo but with gifs instead of dry translation …. For any language. ddeubel, EXCELLENT WORK! . The best idea i have seen. I love the gifs and think they are wonderful to teach esol students without having to recourse to translation and taking advantage of the gif and having them guess what the idea conveyed is and talk about it and come up with some other synonyms, so forth and so on..Great! Thank you eddy. Your support and vision is to be commended. It’s a project of love and I’m glad others like yourself see its worth and the power of instruction and learning hidden in this small “movies”.